Since leaving the emerald city of Seattle around thirty years ago, Tom Kell has become a firm fixture of the L.A. singer songwriter community carving out a diverse career through a variety of different projects. These have included working alongside some of the southern Californian musical elite such as J.D. Souther and Timothy B. Schmidt as well as getting heavily involved in writing songs for children. Yet with a burning desire to showcase several new songs to the wider music listening community and after the absence of several years of doing so, Kell has decided to return to the studio and record a conventional new album. 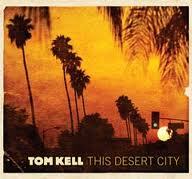 The resultant piece of work is ‘This Desert City’, a record lavished with a southern Californian flavour that allows Kell to use the back drop of the golden state and the wider US south west to express his song writing skills. He does this ably on eight self written tracks competently assisted by an experienced set of backing musicians assembled by producer, Jeffrey Cox. The ten track finished product also contains two interesting choice of covers, a safe version of the sixties classic ‘Don’t Let Me Be Misunderstood’ and a fairly obscure Lennon and McCartney song lifted from the 1965 ‘Beatles for Sale’ album, titled ‘Baby’s in Black’. Both songs give the album a diverse feel without deflecting attention from the record’s prime purpose of highlighting Kell’s song writing skills. The album’s standout song from a personal viewpoint is ‘Texas on the 4th of July’ , a tale of reflection and regret a long way from home, enhanced by the sound of lap steel and accordion to give it a real country feel. This is closely followed by the slow melody tune ‘Dove’ including a duet with Valerie Carter and sublime bottleneck guitar playing by Kenny Edwards. Generally the majority of Kell’s original tunes have that laid back west coast feel about them that, while being very pleasant to listen to, you feel they are not really going to pull up any trees and can easily be described as steady singer songwriter numbers. Album opener ‘Which Road’ and ‘The Way of the World’ definitely fall into this category but the latter does have the memorable line ‘She was a French girl, she came to L.A. for the heat’ as part of a tragic tale describing the allure of the city. The Californian theme continues right through to the final song, ‘I Wouldn’t Trust the Moon’ a highly descriptive thoughtful piece of prose questioning the myths of the golden state with a gospel like feel to the melody. A suitable climax to a well produced and constructed album that shows there’s still plenty more to come from the pen and acoustic guitar of Tom Kell.